Leeds is a democracy and thus allows homes to be built where there is least opposition. There is huge opposition to homes in outer wards and little opposition to homes in inner wards. Home-builders build flats in inner wards and houses in outer wards. In effect Leeds has let the market build flats while restricting the number of houses. House prices in Leeds have risen while flat prices have not. Building enough flats has kept prices down. Logically, building enough homes would do the same. This research is mirrored internationally and a lesson is that allowing developers ‘as of right’ to develop upzoned densities in accessible locations keeps prices down. In light of the recent decision of Tewksbury to veto its own joint plan and a couple of years ago South Beds re South Beds and Luton, who cannot spot the fundamental problems with the Government’s new Clause to the Neighbourhood Planning Bill? to prepare a joint development plan document. etc. Simple it fails to give the SoS power to create a similar joint committee under the 2009 Act. Plans to build tens of thousands of houses in Cheltenham, Tewkesbury and Gloucester have been thrown into doubt. The latest version of a vitally important future planning blueprint covering the period up to 2031, called the Joint Core Strategy, had been agreed by the district councils for Cheltenham and Gloucester. But last night Tewkesbury Borough Council refused to back it – deciding it was not happy with controversial plans to build 1,363 homes in Twigworth, near Gloucester. It followed protests from residents there, who said the flood-prone land should not take such a huge number of houses. The future of the problem-hit plan, which has taken years to get to this stage, now looks uncertain once again. Tewkesbury Borough Council members deferred making a decision on its latest incarnation, deciding that their officers should come back to them with a plan that did not contain the Twigworth allocation in it. One Tewkesbury borough councillor, who asked not to be named, said this morning: “I’m not sure where the JCS goes now. This is a spanner in the works. What Follows the Age of Neoliberal Planning Policy? As we have written here many times the NPPF was the culmination of the project of realizing Neoliberal ideology within Planning Policy. The current May government seems a distinct shift away from Neoliberalism – similar to around the world – abandoning its key aims of a minimal state with austerity and low government intervention. A shift underway even before the Brexit vote in the key institutions of the IMF and World Bank. Secular stagnation, increasing inequality and stalled wages growth in the developed had undermined the key argument that marketisation would lift all boats. Now even the right wing dumb tanks like ASI have started embracing a term hitherto used as a term of abuse a clear sign of being on the intellectual back foot. Neoliberalism always had a loose grip on planning policy. It was not a good fit because even Hayeck recognised the need for a planning system to safeguard property rights and avoiding courts becomining overburdened. Its introduction in the NPPF was done in the crudest possible way. Let me explain, human settlement anywhere in the world is the result of one of three kinds of planning. Planning By Grid – formally planned areas, usually only affordable and sufficient to house the upper echelons of society and the only areas provided with proper infrastructure and services. Planning By Exception – Used by the most wealthy and powerful to short circuit planning rules to develop the most desirable and exclusive land. Planning by Occupation – those who cant afford to live on the Grid, are forced to live off it, through informal settlement, beds in sheds or simply sofa surfing or living in mums basement. Every single example of human habitation around the globe can be assigned to one of these three categories and they can easily be mapped. They map directly to the geographical location of class in countries with weak planning systems. The origin of the street grid and urban planning, in ancient Eygyptian temple cities and the writings of Hippamus of Miletus are clear, planning is to build the city for the worthy, the virtious, the powerful. The NPPF rather than expanding ‘Planning by Grid’ expended ‘Planning by Exception’ to those with the money and resources to force schemes through the system. There was a utopian belief that local communities everywhere would rise up and deliver neighbourhood plans through ‘Planning by Occupation’ but without access to land the main outcome of neighbourhood planning has been to enhance rentier income through keeping land prices in villages high. The fundamental contradiction of neoliberalism was though it proposed free markets it loudest exponents were those who benefited from rentier incomes. The rhetoric was a mask for narrowing not extending markets, keeping house prices high and policies such as overwide Green Belts which maximised rentier income. The world came to distrust neoliberalism as millennials realized it was a scam to protect the property interests of baby boomers and hell to everyone else, a policy which destablised financial markets. This is perhaps clearest in the assault on ‘Planning by Grid’ in the NPPF and planning reforms. Regional planning was lambasted by Pickles and Cameron because of a perceived threat to Green Belts. It had to go. But embarrassingly the need had not gone away and every single area mentioned in CCO press releases as little as two years ago is now planning far larger Green Belt releases. The treat to force local plan progress through planning by appeal, and the architects of the NPPF such as Alex Morton and Johathen Rhodes are contrite and open about its failures. A shift away from neoliberalism means a shift more towards ordoliberalism and Christian democracy and towards the social market with its key ideology of some form of social compact between classes and different segments of society and layers of government. Hence the new emphasis on social housing. We shall have to see how far the government will go to move away from the NPPF. I doubt it will change dramatically for fear of destablisation. But far from being the centre of things I think its appeal led approach will become more residual. Zoning and subdivision planning, masterplanning and new Settlements served European Christian democracies well and many of its methods and solutions will be adopted without acknowledging the very European source. Rather countries such as Malaysia and Canada, which learnt from the Europeans, will be held up as role models. Where local plans are late the government will try to find some proxy to do them that doesn’t look like a regional assembly. County councils will make a come back in areas with two tiers and in the half the country that is unitary combined authorities and joint plans will be the norm. The government has still to get its head around how to deal with overspill from major cities like London (as highlighted in the LPEG report), especially where some authorities retain tight Green Belts. Some authorities are bringing forward Garden Cities, but mainly to deal with local need not overspill. Here National Government needs to take far more of a leadership role. I would not be surprised to see a National Policy Statement on Garden Cities led by a body such as the National Infrastructure Commission to deal with overspill need, which would not prevent locally led Garden cities, suburbs and Garden Villages to deal with local need. I also would be be surprised to see an opdated New Towns Act to deal with value capyure, as long as the leasehold reform act which would prevent Letchworth like Trusts being set up today, is reformed. See here and here for my ideas on this. 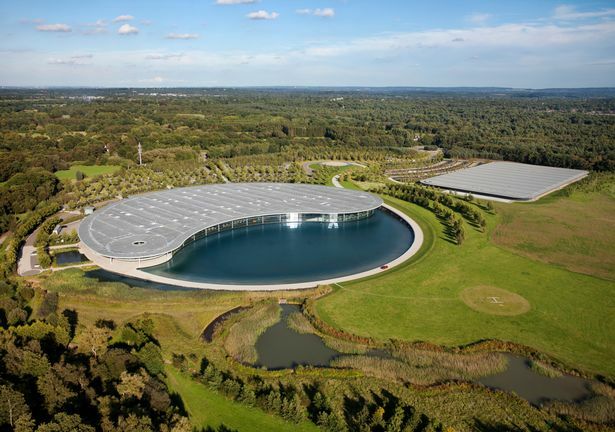 The development outside Woking dubbed a potential ‘McLaren New Town’ will be put to public consultation. The large plot of land in Martyrs Lane, opposite the motoring giant’s headquarters, has been mooted for development between 2027 and 2040. A number of other green belt sites in Byfleet, Mayford, Hook Heath and Pyrford, which were previously earmarked for development, have been removed from Woking Borough Council’s latest draft site allocations document. Originally, Woking Borough Council’s portfolio holder for planning policy, Councillor Ashley Bowes, announced that, if agreed by the council, the entire document would go to a further consultation. After concerns were raised by residents and his own colleagues, the paper in front of councillors at a meeting last Thursday (October 20) was amended by Cllr Bowes to state that the next consultation would be on the Martyrs Lane site alone, with the view that it could replace the smaller plots. Speaking to Get Surrey this week, Cllr Bowes, who represents Pyrford ward on the borough council, said: “People were concerned to know whether by the council voting to go for consultation on all the sites again, whether the council would in some way be prejudicing itself in sites it submitted for examination. “In order to make very clear that wasn’t the case, I thought it was easier to just [consult] on this new potential location in isolation. “I was contacted by some residents that were concerned, including some members of the council. Leader of the Liberal Democrats in Woking, Cllr Will Forster – who first dubbed the development as ‘McLaren New Town’ – told the chamber on Thursday that Cllr Bowes tried to “sneak” changes in and predicted development on the site would cause “huge infrastructure and highway problems”, in its position by the A320. Following strong criticism of the choice of the site, Cllr Bowes said in council officers’ assessments it performed better in environmental terms than other “safeguarded sites” – land earmarked for development but not until after 2027. He said the consultancy Peter Brett Associates was “less critical” of the land than it was of the sites in Pyrford and Mayford. “That is enough in my view that there is something to be answered there,” he said. “I am certainly not saying by the same token it is a site we will end up with. During Thursday’s debate, in which the decision to go to public consultation on the site was agreed, Conservative councillor Colin Kemp said he believed that, as a strategy, to have a large development was “wrong”, while other Tories questioned the merits of the land. Independent councillor John Bond said a 2012 prediction of a deficit of 550 houses had “disappeared” in latest figures. Labour councillor Mohammad Ali, who represents Canalside, argued that by running a second consultation, the council would be set back a year, wasting taxpayers’ money and time – a suggestion denied by chief executive Ray Morgan, who said the delay would be only three months. Cllr Ali told Get Surrey: “Everybody knows [the site] is not big enough. Cllr Ali added Canalside had fewer residents and objections would be outnumbered by representations from Pyrford. What is ‘McLaren New Town’? During summer of 2015, the borough council conducted an initial consultation on its site allocation proposals, attracting 32,712 responses from 1,692 individuals and organisations, many of which concerned the proposed “safeguarded” sites. The consultation on the Martyrs Lane site will commence early in 2017 and the outcome will be discussed at a future council meeting before a final decision on the borough’s “safeguarded” sites is made. Today Sadiq Khan published ‘A City for All Londoners’ a overall policy statement on the direction of travel for all the Mayors strategies in particular the review of the London Plan. Well that’s a doubling of the current 24,230 houses a year. The trend is upwardfs but at the current rate we wont hit 30,000 houses a year for another decade and assuming no market downturn in that period. How does the Mayor address the challenges? So what about the options for meeting the shortfall? In the first instance, I want to protect the Green Belt and other designated green spaces. That means taking bold measures to meet as much of the city’s growth demands within London as possible. I will protect and sustain the important, job-creating role of these areas of strategic national and international importance [central activities zone], by resisting moves to convert offices to housing unless this can be justified. While recognising the need to promote economic growth, I know that the economy is changing and that we must use land intelligently – particularly in the context of a housing crisis that threatens the competitiveness of the city. In some areas, industrial land may be surplus to current needs and could be better used for housing. It may be possible to relocate industry to other areas of the city without disrupting the economy or eroding the critical base of industrial land. And it may be feasible for housing and industrial activity to co-exist in certain locations. But how is that different from teh current London Plan opportunities areas and housing zones? The mayor proposes currently no new ones and we know this scale of land use change is insufficient – all housing zones together would meet one year of London’s housing needs? So what about intensification of the suburbs after ruling out the scale of change in land use required. Intensifying development around well-connected transport nodes will form an important part of my vision for the city, and I will explore the potential of areas around a number of stations as locations for significant and much higher-density housing development. Existing policy – where are the new areas. Other global cities show that it is possible to increase the density of our suburbs without sacrificing the ‘feel’ of these areas. So as well as developing stations in town centres in Outer London, I want to see more smaller-scale housing development in appropriate suburban locations, which will also create opportunities for small local construction firms to build homes. Wee under Ken Livingstone the London Plan ‘maximised’ development densities, under Boris they ‘optimised’ them under Sadiq Kahn he minimises the scale of change so the feel of no area changes. This is not a loosening of policy but a tightening that will deliver no more than a few thousand new homes a year and nowhere near the doubling of output needed. If Khan wishes to hit 50,000 homes a year without loss of Green Belt and significant loss of employment land he needs to bite the bullet and allow for radical increrases in density tearing down two storey houses and replacing them with tower blocks over a borough or two in size. If he doesn’t do this he isn’t seeking to seriously address London’s housing needs. He is sloughing it off to his successors and other authorities in the Green Belt and beyond who will have to mop up the huge housing overspill that his policies will continue and exacerbate. This is not to state that we should radically rebuild London’s suburbs. Some up lift in density is desirable, but radical rebuilding is politically dangerous and the one city which has tried it trying to fix a tight Green Belt – Seoul – failed, as large areas were ripped down and remained unbuilt following a market downturn. Khan needs to consider the modest changes to Londons land uses being considered in places with bold leadsherip such as Birmingham, and Greater Manchester, realising a small proportion of Londons Green Belt as part of a balenced regional plan including some housing in the Green Belt outside London and New Garden Cities Outside London including some in but mostly beyond the Green Belt linked to new transport connections. Treasurer Scott Morrison has put the states on notice over booming house prices, flagging a major push by the Turnbull government to increase supply and help first home buyers own their own home. And Mr Morrison will promise the next meeting of state and federal treasurers, to be held in December, will focus on how state governments can do away with planning rules that stop, or delay, new houses being built. He will also leave the door open to incentives for state governments to reform their laws and release more land, in a broadening of one of the key recommendations of the Harper review of competition policy. In a lunch-time address to the Urban Development Institute of Australia in Sydney on Monday, Mr Morrison will also dismiss suggestions that cheap credit is causing an investor-driven housing bubble in Australia as “simplistic”. The federal treasurer will also admit that the “market is getting away from people. No matter how hard they work or save or even earn, they are finding it harder and harder to get into the market. “Housing in Australia, especially in Sydney, Melbourne and Brisbane, is expensive and increasingly unaffordable, but that does not mean it is over valued,” he will say, according to an advance copy of the speech seen by Fairfax Media. “Housing affordability is also not just a problem for prospective home buyers. As younger people and families are delayed or frustrated in purchasing their first home, this is placing pressure on the private rental market and, in turn, concessional or affordable housing accommodation and ultimately social housing. Therefore, increasing housing affordability – for renters and buyers alike – must be a key priority for all levels of government, including the Commonwealth. “The government will therefore also be discussing with the states the potential to remove residential land use planning regulations that unnecessarily impede housing supply and are not in the broader public interest. This will be the strong focus of my discussions at the next Council on Federal Financial Relations that I will convene in early December,” Mr Morrison will say. The Treasurer points out in his speech that capital city prices, particularly in Sydney and Melbourne, have been growing far more rapidly than in other parts of the country. In fact, he will say, they have grown by 65 per cent and 40 per cent respectively since 2012 lows, though other markets such as Perth and Darwin have fallen. “Between June 2010 and June 2015, the time taken for a dual income couple to save for a 20 per cent deposit in Sydney increased from 5.8 years to 7.9 years. In Melbourne it increased from 5.3 years to 5.8 years. However, outside NSW and Victoria, the change in the number of years to save for a deposit actually fell,” the Treasurer will say. In this context, there are risks to an approach that deals with house prices in those buoyant markets because those measures could have “the reverse effect on markets in other areas”. This is a clear reference to Labor’s plan to cut back on negative gearing and capital gains tax concessions, a key point of difference between the major parties at the last election. The speech underscores the Coalition’s focus on increasing supply rather than, as the government argues Labor’s policy will do, reducing the number of buyers in the market by crimping demand through changes to the country’s tax regime. There is some irony here as evidence emerges of Aus facing an apartments glut and the market facing a downturn, so getting your excluses in first for a government that refuses to remove tax incentives that distort the housing market and create artificial demand for credit growth. 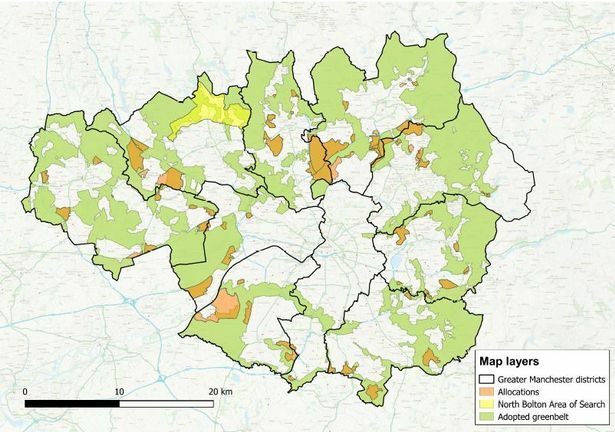 Radical plans to redraw Greater Manchester’s green belt ahead of a 20-year mass housebuilding and jobs programme can today finally be revealed. Restrictions on space currently protected from development in Trafford, Salford, Stockport, Bury, Oldham and Rochdale would be lifted for the first time since the 1980s if proposals by the region’s ‘super council’ are agreed. More than a quarter of the proposed development across the region is on current green belt. We revealed plans were being drawn up to allow building on protected green space last month, but until now the combined authority had kept the final proposals tightly under wraps. All 10 council chiefs are agreed former industrial land across the region should be used before any protected space is developed. However they believe hitting a target of more than 400,000 new jobs and homes by 2035 would be impossible without redrawing the green belt boundary. The London Society has just released a report authored by Johnathan Manns of Colliers of Dr Nicholas Falk of Urbed, with an advisory board that includes intriguingly Paul Miner of the CPRE. One wonders if this is a bit like Ken Shuttleworths ‘Panel of experts’ who dont get to see reports before they are published. The first 28 pages comprises general features for good planning including land value capture and transport orientated development. There is little to disagree with here but it does not make for a well structured report as the application of these principles should grow from the site and its potential and limitations. Very little in planning is apriori. Indeed its a sign of student projects when the first half of a submission is padded out thus without analysing the site. The report focuses on a wedge of land to the West of Heathrow as an extension of the GLAs ‘City in the West’ hitherto wholly within the Green Belt. It is an area which deserves examination as close to Heathrow it is the area which will feel the greatest urbanisation impacts of a third runway (estimated at around 70,800 homes). And nearby Yalding/Gerrards Cross was briefly mentioned by civil servants before the announcement. We have looked at the potential of parts of this area on the blog before. I am a defender of Green Belts, to serve their original function, to shape urban form, stop urban sprawl and to afford countryside recreation. However with programmes to offset displaced housing need they have become purely restrictive devices. With Housing falling short by 250,000 over the next 20 years (even without Heathrow) there is no way by any estimate this can be built within London without redeveloping a couples of boroughs worth of existing housing. Noone is suggesting this, though undoubtedly more can be done. The report contains some good ideas like redeveloping RAF Northolt – an ideal brownfield site if ever made surplus. On other areas it is rather scant treating the area generically – suggesting 100,000 homes sitting on 1/3 of a publicly accessibly Green Web of around 37sq km. The diagrams for this are rather sketchy, which could be counterproductive in raising alarm. To my mind the development is too dispersed and should be concentrated more around key corridors and nodes. Only Langley and Iver within the Green Belt are specifically mentioned. I many ways this broad area is not ideal as it is the meeting point of the M25 and the M4, and so large amounts of new housing could simply jam roads, also the Colne Valley is very low lying and prone to flooding. Indeed this rules out large scale (as opposed to medium scale) development around Langley station. 2. Can we maximise the opportunities from improved surface access to Heathrow. A hub station on the WCML was proposed east of Iver station with a ‘people mover’ to new terminals/ The Airports commission report rejected this as inferior to a new rail connection to Slough and Reading. The two are not incompatible, there would be a regional metro type scheme from Reading to Heathrow with interchange station at Iver and bRT connections to this station. Iver station doesn’t suffer from flooding and there is an area not contributing to the Green Belt surrounded by brownfield sites. This is a potential city centre area for a new Garden City. But you want to develop away from the motorways because of noise and avoid the merger of Langley and Iver. So 10,000 or so is a more realistic estimate of potential here even at high density. There are other areas with could be developed as nodes and linear corridors to ths hub, mainly to the north. Crucially the Iver North water treatment works could be expanded to cope and feed into the river Colne, always the first question you should ask in setting down a site for a new settlement. A huge national grid substation could be expanded at Uxbridge Moor. To the North there are areas of Ribbon Development to the South of Iver Heath which could be filled out with medium density housing along a transit corridor to Iver, around 3,000 house potential. This links to Pinewood where you could build 1,000 homes on a brownfield site. Though previously losing an appeal proposed changes to national policy would make it appropriate development. To the North of Iver you could fit another 2,000 houses, as well as two township to the nroth and South of the M40 of around 5,000 houses each. The extremely low density mansions around Langley corner could fit another 2,000 or so houses, and another 2,000 north of the woods here. South of Denham Station you could fit around 5,000 houses at medium density, and 2,000 west of Gerrards Cross at Low Density. To the North of Denham Station at the Golf Course and old Aerodrom is space for around 10,000 homes at high density. This is also the HS2 route and with the right HSR techncologyb there could be a commuter station here, like many on the edge of Tokyo. A wedge of land north of Denham and South of Maples Cross could take around 7,000 houses at Medium density. At Chorelywood Bottom their is land surrounded by motorway and urbanization which could take around 5,000 homes. And another 5,000 with a western expansion of Chorelywood to the woods itself and again to its north. Between George Green and Shredding Green their is a potential for a new Township to Slough which could take around 7,000 houses. A final township area could be around Horn Hill and South of Newlands Park, around 5,000 houses. With a BRT connection to Heathrow in less than 20 minutes you could develop the housing essentially car free and with permitted parking on all roads. None of the above requires development in the Colne Valley Regional Park or Chilterns AONB. The BRT could also connect through to Uxbridge and Ruislip for the underground system. So with a more focussed approach, around opportunities and constraints, this area has real potential and could solve a real issue around Heathrow urbanisation.